Hello Friends! Today we are going to discuss a very interesting topic which is FREE COMPUTER ANTIVIRUS which is available in our Personal Computer. This is post is written in Two Languages. First one is English & second one is Hindi. हेल्लो दोस्तों आज हम एक बहुत ही interesting Topic पर बात करने जा रहे है. इस Topic में हम बात करेंगे Free Computer Antivirus Microsoft Windows Defender की. जो कि हम सभी के Computer में Available होता है,किन्तु हममे से कई लोगो को इसके बारे में पता भी नही होता है. यह पोस्ट दो भाषाओँ में लिखी गई है. एक है Hindi और दूसरी है English. How to Start Online Earning in Dollar without Investment. So Friends! Earlier also I have written 2-3 post related to Free Antivirus. 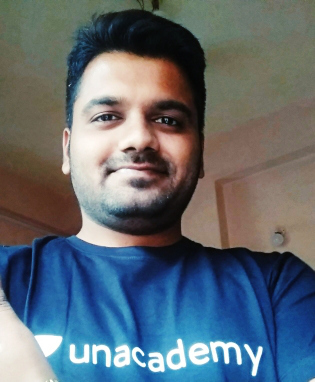 In a previous post, I wrote about Free Antivirus which is launched by Indian Govt. But Today again we are going to discuss on a Free Antivirus, but it is not launched by Any of the Govt. This Free Antivirus is available in our Computer only. This antivirus never asks for buy a license like others. Without license also this Antivirus will work properly in your system. तो दोस्तों ! 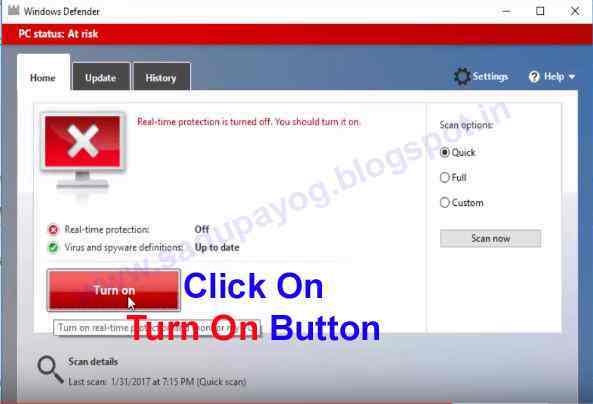 पहले भी मैं Free Antivirus से सम्बंधित 2-3 Posts लिख चूका हूँ. मेरी पिछली एक Post में मैंने एक Free Antivirus के बारे में बताया था जो की Bharat Sarkar के द्वारा Launch किया गया है.यदि आप भारत सर्कार के द्वारा लांच किये गया Free Antivirus वाली Post को पढना चाहते है तो यहाँ Click करें | लेकिन आज यहाँ हम जिस Free Antivirus के बारे में बात करने जा रहे है वो किसी भी देश की सरकार ने Launch नही किया है | यह Antivirus हमारे Computer में शुरू से ही आता है , लेकिन हम में में से कई लोगो को इसके बारे में पता नही होता है | इस Antivirus के लिए हमे किसी भी प्रकार के License की आवश्यकता नही होती है , जैसे कि दुसरे Antivirus में होती है. Free Download Mobile Ringtone by your name. So the Free Antivirus which is available on our computer is WINDOWS DEFENDER. Yes, friends! This Antivirus is fully free available on our computer. We need not install or purchase this Windows Defender Antivirus in our PC. If You are using any Free or Trail version of Antivirus in your system then I'll suggest you that you have to use Windows Defender in your Computer System. You can use Windows Defender only when you are using Microsoft Windows Operating System. Because this Windows Defender is available only of Windows OS users. So make sure that you are using Windows OS if you wanted to use this Windows Defender. Accounting Tally Course Launched by Indian Govt. How to Develop a Free Website or Blog in Hindi. तो जो Free Antivirus आपके Computer System में Available है उसका नाम है विंडोज डिफेंडर | जी हाँ दोस्तों यह Antivirus पूरी तरह से free है. हमे इस Antivirus को अलग से Install करने या खरीदने की आवश्यकता नही होती, जबकि हमारे Computer में ही यह Antivirus उपलब्ध होता है | यदि आप अपने Computer में कोई Free या फिर trail Version वाला Antivirus use कर रहे है तो मेरी आपको यही सलाह होगी की आप उस Free या Trial Version वाले Antivirus को अपने Computer से Remove कर दीजिये और Windows Defender का use कीजिये. यह आपके Computer को बहुत ही बेहतरीन तरीके से protect करेगा. यदि आप Windows Defender का Use करना चाहते है तो इसके लिए जरुरी है कि आप Microsoft Windows ऑपरेटिंग सिस्टम का Use करे रहे हो. 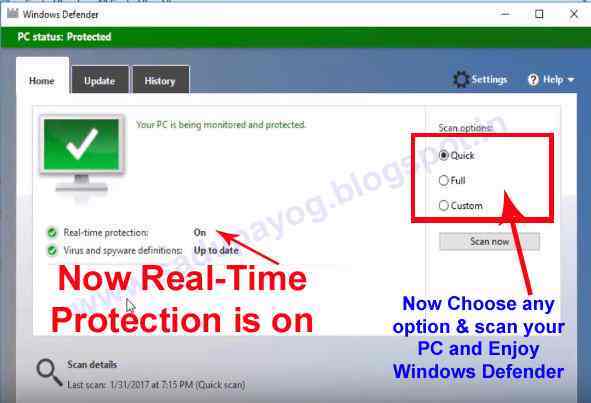 क्युकि Windows Defender जो Antivirus है वो Especially Windows OS users के लिए बनाया गया है जो की Microsoft का Product है. Earn money online from Money Mail. Earn Money Online by ClixSense. 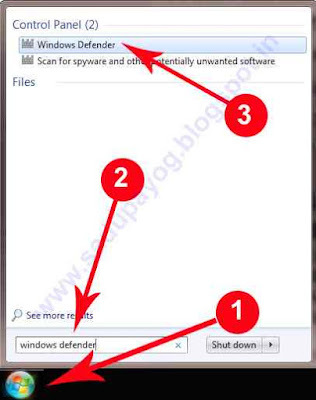 To use Microsoft Windows Defender follow the given steps. 2. Type WINDOWS DEFENDER in the search box. and then click on Windows Defender. as Shown in below Image. 1. सबसे पहले Start Button पर क्लिक करें . 2. इसके बाद जैसा की चित्र में दिखाया गया है कि Search Box में Windows Defender टाइप करें. 3.अब Windows Defender पर Click करें. ऐसा करते ही Windows Defender Open हो जाएगा. Now Click on Turn On Button as you can see in Image. As you Turn on this button The Real-Time Protection will be on in your PC. जैसे ही आप Turn On बटन पर Click करेंगे आपके PC में Real-Time Protection on हो जाएगा. और Windows Defender Free Computer Antivirus आपके कंप्यूटर में अपना काम शुरू कर देगा. As you can see in the Image The Real-Time Protection is on in your PC. 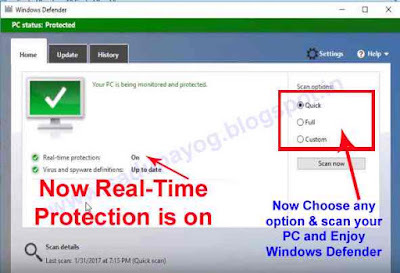 now you can choose any of the option given in right side of the Windows Defender and start scanning your PC and Enjoy Free Computer Antivirus Windows Defender. So Friends! Today we learned about Windows Defender: A Free Real-Time Computer Antivirus launched by Microsoft. If You Like this post please do comment so I can upload more & more post related to Computer, Internet, Facebook, What's App, Technologies etc. Thanks for the spent time on Sadupayog Best Hindi Blog. Top Wi-fi Password Hacking Mobile Apps. अब आप Right Hand Side में दिए गये Options में से कोई भी Option को select करके अपने Computer Scan कर सकते है. तो दोस्तों आज हमने Computer Antivirus : Windows Defender के बारे में जाना.आपको मेरी यह पोस्ट कैसी लगी Please Comment करके जरुर बताएँ. मैं एक बहुत ही Interesting Post लेकर आपके सामने हाजिर होने वाला हूँ जो कि आपके बहुत काम की है. तो दोस्तों मिलते है बहुत जल्दी मेरी Next Post में . तब तक के लिए जय हिन्द जय भारत.